Smile for military cooperation: Chief Officer at «KV Barentshav» Frode Urke (left) and Head of the Northern Fleet's exercise unit Aleksandr Ulyanov (in the middle) are happy to work together in the Barents Sea. The scenario is realistic; missing people and people in distress at sea and prevention of oil spill pollution. Tactical navigations, missiles, guns, warships and submarines. It has been a busy spring with several exercises in Arctic waters for both Norwegian navy and Russia’s Northern Fleet. A few days ago, Norway’s frigate «KNM Roald Amundsen» teamed up with about 10 NATO ships from the Netherlands, Germany and Denmark in the waters outside Andøya, Northern Norway. Ealier in May, five NATO countries participated in a anti-submarine exercise outside Nordland. Simultaneously, the Russian Northern Fleet exercised live shootings in the Barents Sea, just north of the Kola Peninsula. A week earlier, the ballistic missile submarine «Yury Dolgoruky» test-launched a volley of four Bulava nuclear missiles from the White Sea, the largest salvo shooting in nearly three decades. Military tensions between NATO and Russia are rising. The United States is reactivating its Second Fleet to counter Russian naval activities in the North Atlantic. The military confidence building between Norway and Russia taking place from the mid-90s was suddenly put on halt after Moscow’s annexation of Crimea in 2014. Norway shares a maritime border with Russia in the Barents Sea and Arctic Ocean from the Varanger fjord at 69 degrees north to 84 degrees north, nearly half the way between Spitsbergen and the North Pole. The annual Exercise Barents is a single important arena nowadays where Russian and Norwegian armed forces work together. With all tensions, it was a relief for both sides to see the other smile again when meeting in uniforms in the Barents Sea this week. The annual Exercise Barents is a single important arena nowadays where Russian and Norwegian armed forces work together. It is also a stage where both civilian and military units from both countries interact and share resources. The scenario is real enough: A fishing boat with striking name «Fishalot» from Hammerfest with a crew of 10 sinks somewhere in the maritime border area, exact location is unknown. People might be in the freezing cold water. Norway’s Joint Rescue Coordination Centre in Bodø triggers the alarm bell and authorities in both countries go on alert. Search and Rescue units are scrambled from all over. A Sea King from Banak air station in Finnmark takes off, simultaneously as two Coast Guard ships - «KV Farm» and «KV Barentshav» - sail out from Kirkenes. The Barents Observer are on board the last. From other ports on Norway’s eastern coast to the Barents Sea, a SAR vessel, a tug and the Coastal Administration’s ship «Bøkfjord» sail in at full speed to assists. From Russia’s Kola Peninsula comes the new military logistics support ship «Elbrus» along with the rescue tug SB-535. The airforce scrambles an Ilyushin-38 maritime patrol plane from the air base Severomorsk-3. A civilian Mi-8 rescue helicopter flies to the area from Murmansk and both a FSB Coast Guard ship and the civilian supply and tug «Umka» are soon in the area. «Umka» is the vessel which two weeks ago assisted with towing of Russia’s first floating nuclear power plant, from St. Petersburg around Scandinavia to Murmansk. From Kirkenes to the search area is a three hours voyage. Both the Sea King helicopter and the Ilyushin plane are in place long before the ships arrives. When searching for people in the sea from a sunken ship, every minute counts. Water temperature is about 3 to 4 degrees Celsius in the Barents Sea this time of the year. Not even a good survival suit can keep you alive for very long time when floating around in the water north of mainland Europe. If people are in a raft or a life boat, chances are better. But not guaranteed. Searching from the air, reports soon came in that a red life raft was seen. Shortly after, the helicopter crew radioed another life raft discovered. Also people (actually dolls dressed up in survival suits) were seen from air floating not too far away. The crews from both the Norwegian and Russian aircraft reported in positions and a more concentrated search area could be determined. On board «KV Barentshav» it soon became clear that it was the same life raft which were found two, or even three times by different search units. Such large scale international SAR operation requires special focus on coordination, not always easy to plan up-front at tabletop exercises. Radio communications in Norwegian, English and Russian are sounded in the exercise control room on the bridge of «KV Barentshav». Radars and maps are screened on the wall. The time-line of events are frequently updated on the white-board. Here are people with uniforms from different agencies and branches. Map coordinates are exchanged between the ships and the Joint Rescue Coordination Centre. Which resources are where and when and how long time does it take to sail or fly. Apparently, the flow charts work well, everyone know what to do and what information needs to be given to whom and when. Different languages, command-chains and pre-learned cultures involving civilian and military structures require some ad-hoc solutions. Originally, it was agreed that the Norwegian Sea King helicopter should send in a written request to Russian aviation control authorities to be allowed to enter Russian airspace in the exercise area. So said, so done. But no written confirmation came back, so an oral permission was given and the SAR helicopter turned east across the border in a continued search for more of the 10 people missing. Norway’s fleet of Sea King helicopters belongs to the No. 330 Squadron unit of the Air Force. In 2007, a helicopter from Norway’s 330 Squadron entered Russian territory on request from the rescue centre in Murmansk and made a last-minute rescue of 12 seamen from a Russian cargo vessel being crushed against the rocky shores on the Fishermen Peninsula in stormy weather. All 12 were brought to hospital in the Norwegian border town of Kirkenes before returing home to Murmansk. Back in 1995, the two countries signed an intergovernmental agreement on cooperation in search and rescue for the Barents Sea. Exercise Barents is a follow-up of the agreement and works as an annual bi-lateral drill at sea in the Varanger fjord area. Last year, the exercise was headed by the Russian side. Now, it’s the Norwegians who are in charge. Like the Norwegian helicopter is allowed to enter Russian airspace, the military Northern Fleet’s «Elbrus» was granted permission to sail into Norwegian waters. Sounds logical in a search and rescue scenario, but still a small milestone in a continued trust and confidence building period of time following the colder geopolitical climate between east and west, also in the high north. Just a year ago, Russian bombers simulated attacks against Norway’s NATO radar in Vardø and other targets in Northern Norway. The Vardø radar is visible in the far horizon from today’s current exercise area where the two countries military now are cooperating. We need to cooperate with each other, because we see dangerous atmosphere now. «Such exercise is really important, I guess for both sides, Norway and Russia,» says Igor Makeev, Captain Coordinator with Murmansk Maritime Rescue Centre. «We need to cooperate with each other, because we see dangerous atmosphere now so we need to make exercises every year.» «The exercise will be even better next year. For sure,» smiles Makeev. Director of the Joint Rescue Coordination Centre of Northern Norway (JRCC), Bent-Ove Jamtli agrees and pinpoints the need for cross-border cooperation in the Arctic. «Long distances, limited resources, common challenges in the north, all makes it necessary for Norway to cooperate with Russia and prepare for the day when teaming up together could be needed for real,» Jamtli says. The more Norway and Russia exercise together, the more confident I am that we can do a good job in a real situation. Thor-Eirik Torkildsen is Rescue leader with JRCC and in charge of the search for the exercise’s «missing fishermen» in the maritime border area. «We need to practice together, to make sure we have good communications systems and that we are able to talk to each other to do the job,» Torkildsen says. «The more Norway and Russia exercise together, the more confident I am that we can do a good job in a real situation,» he explains. It takes about three hours from the exercise’s alarm bell was triggered until all 10 «people» from the «sunken» fishing boat are found. Two on board the life-raft, the eight other floating around at different locations in the sea. Some on the Norwegian side, some on the Russian side of the maritime border. The red survival-suit-dolls are soon lifted up from the freezing water by helicopters and the speedboats from the Russian navy and Norwegian Coast Guard. All the dolls were dropped at sea many hours before the first rescue resources arrived. Consequently, some of them drifted miles before being found. Both the Sea King from Banak and the Mi-8 from Murmashi got opportunity to train fast-roping to each other countries’ vessels. Lifting up dolls from one vessel, roping them down to another. Exercise Barents and Norwegian-Russian cooperation on SAR is well known internationally and recognized for its importance and success. Possible larger international exercises is still to be seen, but the Arctic Coast Guard Forum, currently headed by the Finnish chairmanship, surely has a goal to team up for a real drill somewhere in the Circumpolar waters. In April, a training rescue mission was played in a simulator in Turku, Finland with participants from the Forum’s eight Arctic member states. The Arctic Coast Guard Forum is currently the only Circumpolar cooperation where people in uniforms from all nations meet for developing joint goals and partnership in the high north. Harvey Vardy is Superintendent Maritime Search & Rescue with the Canadian Coast Guard Atlantic Region in Nova Scotia. He is on board «KV Barentshav» to observe the joint Russian-Norwegian exercise. «It is very interesting to see how well arranged the exercise is and how good the different units are doing the job and how it all is coordinated,» Vardy says. 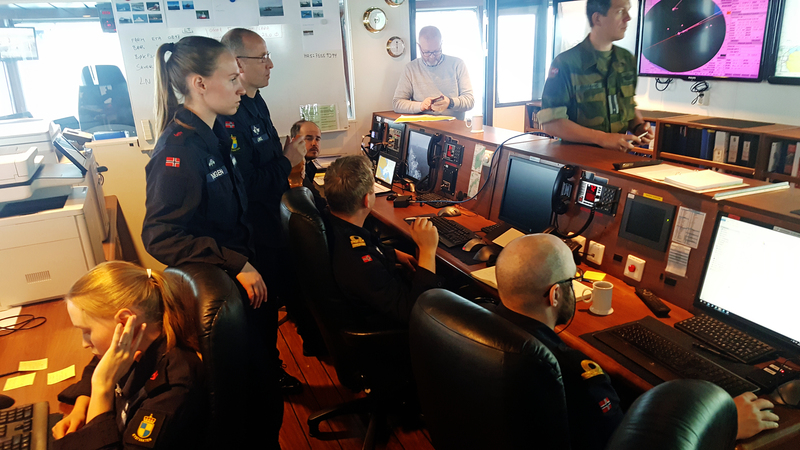 Meeting for a brief on board one of the Norwegian Coast Guard vessels after the drill is called off, the Canadian observer’s conclusions are confirmed. «This was great, we could see how each others capacities and how they worked across the border,» Bent-Ove Jamtli concluded. Rescue coordinator Thor-Eirik Torkildsen praised the many resources becoming available in such short time after the alarm was triggered, but said this also created some challenges fo the coordination work. An example was the finding of the same life raft several times. «Unpredictability and a moment of surprise is important to get such exercises as realistic as possible,» Bent-Ove Jamtli with JRCC replied. In all, hundreds of people, nine ships, two planes and two helicopters participated. Two resources that was supposed to take part couldn’t make it, a Norwegian military Orion surveillance plane and a Russian Ka-27 military helicopter. 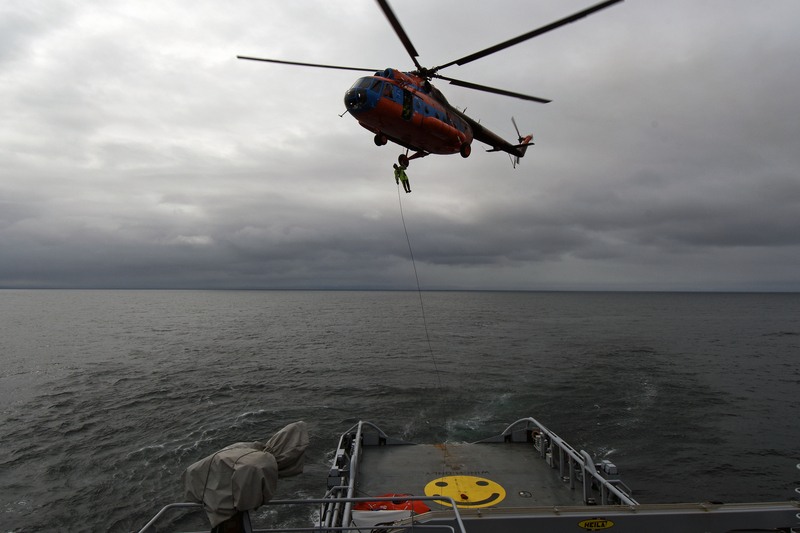 Exercise Barents is not only about saving people in distress at sea. Another highly focused cooperation is how to avoid oil spill in the fragil Arctic marine ecosystem. Therefor, the second phase of the drill included thousands of liters of fake-oil on sea from the «sunken» fishing boat and joint preparedness and actions to limit and collect what’s on the water. 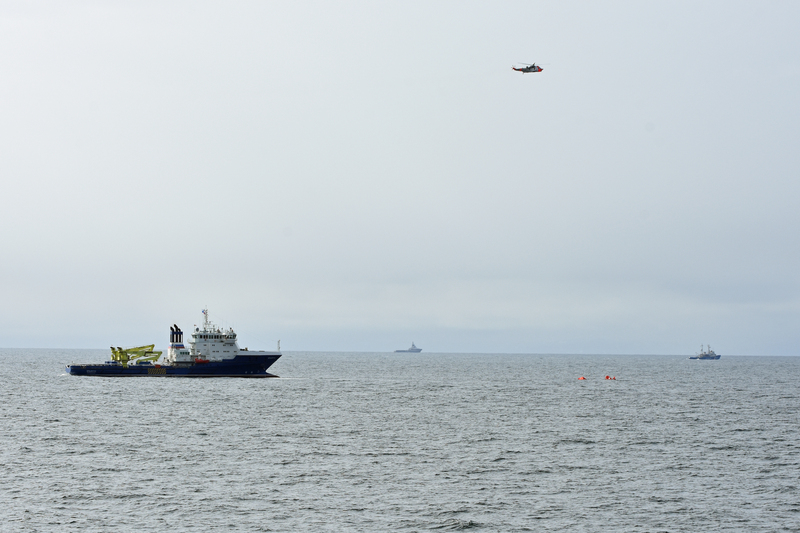 Oil lenses are put to sea from four of the ships, including the Northern Fleet’s «Elbrus» and the Coast Guard «KV Farm». Additionally, the Coastal Administration’s pollution control aircraft circles the skies to estimate the range of the spill. At the end, the weather puts a limit to such oil spill cleanup operations. «This is first of all important to us since it is an bilateral exercise with Norway and Russia. To practice together in the Barents Sea and get a common understanding,» says Jan Pedersen, Senior Advisor with the Coastal Administration’s Centre for Emergency Preparedness. See more photos from Exercise Barents-2018 in the gallery at the end of this article. Support independent, nonprofit journalism. For 15 years, the Barents Observer has provided serious, fact-based journalism and stories from the Barents region and the Arctic. Please help us continue to be a voice for press freedom in the borderland to Russia. Get engaged and give a small donation.